In talking with a few friends several days ago about the topic of goals, I felt I needed to elaborate a bit more on my recent post about making achievable New Year's Resolutions. 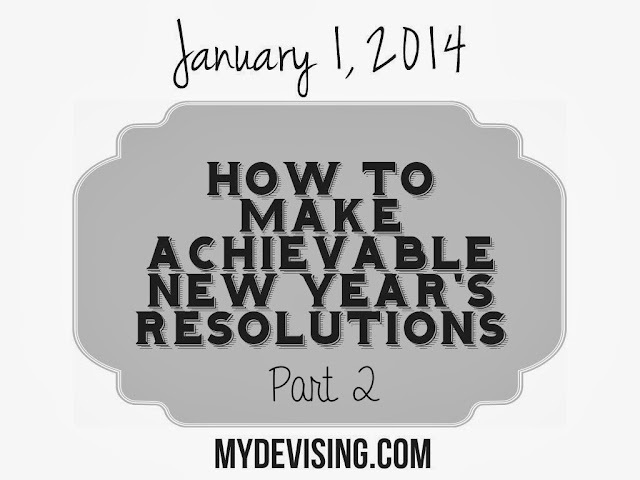 Sara asked, "But what's the point of making goals if you know you're going to achieve them? Where's the challenge?" It was a good point. So, allow me to clarify. First of all, that post was mostly aimed at the New Year's Resolution haters and people that just don't have goals period. If you're already setting goals and achieving them, that's awesome! You probably have a great system in place and you probably don't need any of my help. But if you find yourself in the same spot, year after year, doing the same things, that post was for you. My intent in writing that post was to offer boundaries. Goal setting may seem overwhelming to you. Maybe it seems like something you can't wrap your mind around. Maybe you never do it. That's why I wrote those 5 tips. They can help you figure out what exactly your dreams are and how to manage them in such a way that you will feel successful. Why is being successful so important? My guess is that if you've set goals year after year and have never attained them, you've probably given up on goals entirely. My purpose was to get you out of that rut - to find a way to make it work for you. If you've never once worked out 7 days in a row, then probably don't act like you're going to start. Start small and then if you go above and beyond, that's great. Commit to working out 2 times a week, or 3 times a week. Not because you CAN'T do 7 times, but because that's probably overwhelmed you in the past and it's seemed like an unreachable goal. Allow yourself to be successful. Sometimes "getting in shape" can turn into "join a gym, run a marathon, drink more water, eat only organic foods, and exercise 3 times a week." Holy heck, that's a lot of stuff. Yes, it's a lot of great stuff, but most people are going to feel defeated when they get to the end of the year and realize they've only exercised once a week all year. You have to pick and choose. What is it that you want to do? For some, "getting in shape" sounds really terrible and there's practically nothing that sounds appealing. But if that's your goal, that's your goal. So how can you make it something enjoyable? Most exercise isn't enjoyable right at first, but once you get the hang of it, it's fun! Most humans don't like things they aren't good at, just FYI. If you're a "bad" runner, you may hate running. You are not unique in this. If you hate people watching you work out, a gym may not be the best idea. So what will you do? You're going to have to find something that sounds at least halfway appealing. Don't plan on becoming a Zumba expert if you really hate dancing. Think about how you can make your goal enjoyable so that you will actually want to do it. Newsflash: "Getting in shape" isn't a good goal, you guys. What does that even mean? It could mean something completely different to me than it does to you. You've got to determine what exactly IT is or you won't know what you're aiming for. Examples of "getting in shape" may be: run 2 races, get a gym membership and go twice a week, go to a yoga class with friends once a week, ride my bike 3 times a week, buy Jillian Michaels' 30 Day Shred and do it on Mondays/Wednesdays/Fridays, stop eating fast food. Now, remember, it's not ALL of those. But pick one or two. Name it and make a plan. By "write it down," I'm basically telling you to write it down somewhere that other people can see it and maybe even ask you about it. Put it on a chalkboard or on your refrigerator. Writing it in a journal may not be helpful for you unless you're extremely self-motivated and driven. An even better option would be to tell someone. "Hey, I'm really trying to get serious about my health and I've wanted to for a long time. My goal is to go to the gym twice a week. Will you help me by checking in and just making sure I'm sticking to it?" After Sara mentioned the no-challenge thing, my mind got all flustered. I can't live with myself if anyone on this earth thinks I DON'T believe in challenges. Hello?? Do you know who I am?? So, all this to say - set goals that are challenging but not overwhelming. You can do it! Such good advice! I am terrible at New Year's resolutions. Hahah...I knew even before reading this that somehow it would involve me! You're great at doing challenging things Claire...and I am not! I'll try to set some better goals this year. Love you!